Sometime back I wrote up one of my favorite whiskey drinks, the 1794 Cocktail. At the time, I thought of the 1794 as an improvement of the classic Boulevardier, but it might be just as accurate to think of it as a variant of an even older drink: the Old Pal. I remember way back in 1878, on the 30th of February to be exact, when the Writer was discussing this subject with my old pal “Sparrow” Robertson and he said to yours truly, “get away with that stuff, my old pal, here’s the drink I invented when I fired the pistol the first time at the old Powderhall foot races and you can’t go wrong if you put a bet down on ⅓ Canadian Club, ⅓ Eyetalian Vermouth, and ⅓ Campari,” and then he told the Writer that he would dedicate this cocktail to me and call it, My Old Pal. Aside from the ridiculous calendar references, there’s also that little bit about “Eyetalian Vermouth.” McElhone had originally published the Old Pal (in Harry’s ABC ) as equal parts Canadian whisky (not specifying Canadian Club), Campari, and Dry vermouth. We’re left with a bit of a conundrum. Either McElhone wrote it down wrong in 1922 and corrected it, via Moss, in 1927; or they both just got it wrong in 1927; or the Old Pal evolved. We have no way to know which recipe is the “true” Old Pal, but we know which vermouth won the battle: the dry, French vermouth version is the one that has come down to us as the canonical Old Pal. But is has, of course, evolved. The modern version of the Old Pal is more whiskey-heavy than the original. As with the 1794 Cocktail, the Old Pal works much better with 2:1:1 proportions than with the original equal parts—increasing the whiskey gives the drink a focus and balances the aggressive Campari better. Combine all ingredients and stir with ice until very cold. Strain into a chilled cocktail stem. Express and garnish with lemon. The Old Pal is an excellent showpiece for high-proof rye whiskies like Rittenhouse 100. You want a whiskey with backbone to stand up to Campari, but well-aged, assertive, lower-proof ryes can work, too, particularly at the 2:1:1 proportions. 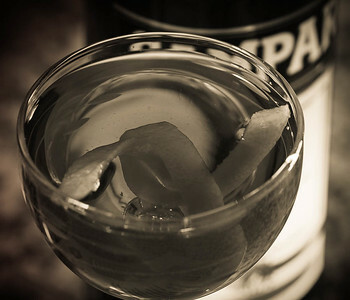 Your choice of vermouth can strongly alter the character of the Old Pal. The M&R makes a lighter, and to my mind, more refreshing Old Pal; the more herbal or aged vermouths like Noilly Prat’s Original Dry push herbs and the more earthy components of the drink to the fore. This is a good place for experimentation. My preference is for the M&R version; even though it seems a bit less sophisticated, the flavors seem to cooperate better with the M&R. 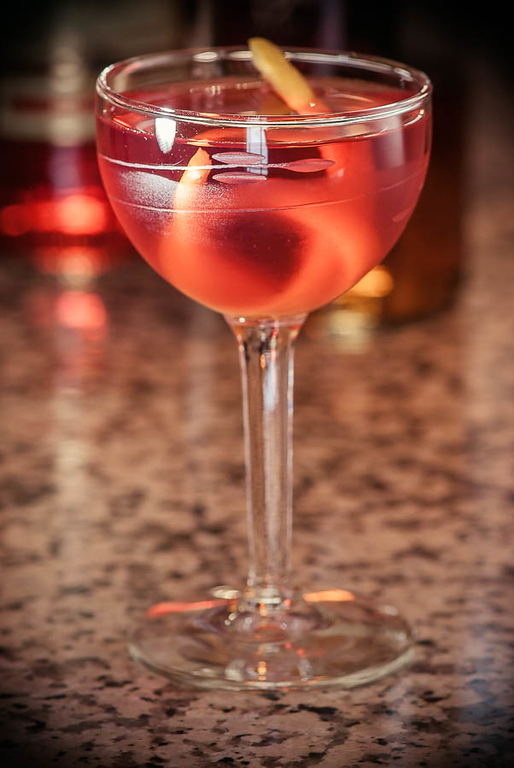 The lemon garnish is absolutely perfect for this cocktail; the expressed oils are a delight to the nose, and the bit of light citrus blends nicely with the Campari. Don’t leave it out. The original equal parts Old Pal is much less sweet than its counterpart Boulevardier; substituting rye whiskey and dry vermouth for the Boulevardier’s bourbon and Italian vermouth makes a significant and fundamental difference in the way the two drinks present themselves. The modern formulation is more precisely compared to the 1794 Cocktail; the result is the same—a drier cocktail—but the difference is less pronounced with the large portion of the rye whiskey in both drinks. The Old Pal comes across as slightly less sweet, and a bit less complex, than the 1794. “The Old Pal Cocktail” at cold-glass.com : All text and photos © 2013 Douglas M. Ford. All rights reserved. Thanks for this excellent research, part of the pleasure of finding old cocktail recipes is discovering the background details of their names and provenance. Pioneers of Mixing Whiskies at Elite Bars lists a variation named “Pals of Old,” which keeps the equal measures but replaces the Campari with Bacardi and adds a dash of Abbott’s bitters (I used Reception Bitters). I was expecting this liquor-heavy version would be very bad, it sounds like the sort of prohibition-era crazy mixture that Patrick Duffy would have marked with a warning dot in the Mixer’s Manual. Instead, I was pleasantly surprised to discover otherwise, although I should admit it wasn’t my first drink of the evening. I’m assuming that Campari wasn’t highly available in America at the time, and the Bacardi-bitters combo was supposed to be a substitute. Patrick Duffy’s warning dots—what a great system. Bacardi and bitters is an interesting idea for a Campari substitute. I look forward to giving “Pals of Old” a try, thanks for posting it. Hi Doug – I recently rediscovered this post. I have it on good authority that the Old Pal is not in Harry’s ABC. (I don’t own the book, but it’s Wondrich/Boehm are my fact-checkers on this.) Do you know where you got that info about it being in the book or an earlier reference with sweet vermouth? I suppose I should have made a link of that reference, and perhaps I’ll retrofit it. The ABC reference is based on Erik Ellestad’s SavoyStomp writeup on the Old Pal, at http://savoystomp.com/2009/05/17/old-pal-cocktail/. As I’ve written elsewhere: Alas! that I’ve never seen an original ABC, to verify. I have noticed that there is some recent controversy about the real first publication date. My journalism professors would have been very unhappy to learn that I had so baldly published the 1922 ABC attribution without having a first edition in hand, or at least without a little wiggle room for deniability. I don’t know of an earlier reference to sweet vermouth (which I take “Eyetalian” to be), before the 1927 Moss account in Barflies. Thanks for the question; I look forward to hearing how this comes out. Thanks! I think the ABC ref was a mistake. I do wonder what happened after this (how it became dry vermouth) and if it was another of the numerous Savoy copying errors. I found the book “ABC of Mixing Cocktails”, but it’s 1930 edition, in this book it show me the recipe is: Canadian club, French vermouth(I dont know if it dry or sweet, but in my opinion it could be sweet, cause in the past, lot of recipe is vermouth without dry or sweet, but most of them are sweet right now. On the other hand I believe at that time people more like sweet drinks like Bijou ), and Campari. And about Eyetalian, its a slang of American means Italian American Style or just means Italian. Hope those could help you to find out the truth. My take on vermouth references in older cocktail manuals is to interpret “French” as meaning dry white vermouth, and “Italian” as meaning sweet red vermouth. Thanks for commenting, and congratulations on having a 1930 ABC.